Right then, that's us done and dusted for another busy Saturday. Don't forget to tune into Match of the Day on BBC One at 22:30 GMT tonight for all the goals and talking points from today's games and we will back tomorrow with live coverage of Sunday's big games - Arsenal v Stoke and Manchester United v Southampton. Matt in Harold Wood: And that, ladies and gentlemen, is why Spurs will not be in the top 4 at the end of the season. No point us beating the likes of Chelsea, if we then lose to the likes of Palace. Paul in London: All the hard work against Chelsea undone. Clearly, Spurs should have had a penalty but the damage had been done. Complacent at 1-0, sloppy at 1-1, and zero composure in the last few minutes. As always, just when you think things are coming together, Spurs shoot themselves in the foot. Bob: Another Premier League game another poor decision from a referee. Something has got to be done about the shockingly bad level of officiating in this country. How has Lawro got on in this weekend's Premier League predictions? Very well indeed is the answer. He has got six of the eight results correct, and two scorelines absolutely bang on. Have a check of how he sees tomorrow's games - Arsenal v Stoke and Manchester United v Southampton - going. Laurie Barton: When was the last top-flight London derby with two or more scorers who were all Londoners? John Roberts: Ref gives a dodgy penalty to Palace, then misses a blatant one for Kane. But apparently it's all Alan Pardew's doing? Matthew Tabor: A Shakespearian script of a game. An absolute footballing tragedy that Palace won this. Non existent for 70 minutes. "First person to text me was Mike Ashley"
More from Alan Pardew, speaking to BBC Sport: "To go a goal behind to a great team in great form, full credit, not just to the maverick players. Two moments I pick out, a tackle from Delaney and then a save at the end. Two moments you need from senior players." Have you missed the kind of support you got at the end? "I have missed it in the last 18 months. I remember we won at Man Utd away last year, that was a proper team, we had Cabaye, Remy, a proper team, and I never got that since. So it was good to get back to that and the first person to text me after the game was Mike Ashley, a nice touch." "The MOTD running order: Chelsea v Newcastle, Everton v Manchester City, Crystal Palace v Tottenham, Burnley v QPR, Leicester City v Aston Villa, West Brom v Hull, Swansea v West Ham, Sunderland v Liverpool." Match of the Day is on BBC One at 22:30 GMT. Twitter: "Dream start for Alan Pardew. Great response from the players." Crystal Palace boss Alan Pardew: "This team is too honest and that is a strange statement for a Premier League manager to make. We need a maverick to release ourselves, we did not do that until the second half and once we did we looked a good side and total dominated from that spell onwards. "Hopefully a victory today will give the likes of our midfield players the ambition to go up the pitch a bit, five yards would do. "Wilfried Zaha is a little negative about the team not giving him the ball and I left him out of the starting line up in a way to test him and see what his reaction was like and it was good, strong and he changed the game for sure." Lee Hounslow: Typical, beat Chelsea get our hopes up but when it comes to a battle with a lower team we haven't got the stomach, choked! Martyn Jones: Well done Spurs, perfect opportunity to claim 4th spot. When the heat is on, Spurs vaporise. Matt Cartwright: Now that's typical Tottenham. We beat the team who'll prob win the league one week then next lose to one who may get relegated. Tottenham boss Mauricio Pochettino: "Yes [decisions were key today]. After I think 65 minutes we were in control of the game, the penalty changed it all, the energy, it changed all. The decision, maybe it wasn't a penalty and it is key in the result. From my dugout it's difficult to give my opinion but my players say he never touched the player. "Harry Kane's [penalty shout] was the same as the penalty for Crystal Palace. Difficult to see from my position, but one against us and though we conceded another goal, maybe it's important, this decision. "It was difficult after we conceded the goal. They showed more energy than us in the last 15 or 20 minutes. For that I'm disappointed, after we conceded, Crystal Palace were better." Ben Walker: Alan Pardew getting the support he deserves. Holmesdale stand singing his name. Good luck Newcastle finding a better manager. Ali Hussein: Well done Mr Pardew, you deserve a lot credit for your work at Newcastle. Nick Maund: Pardew's first season is often good, lets see if the Palace fans are still behind him after 12 months of being 'Pardewed'. Crystal Palace forward Jason Puncheon: "The first half we stuck in there and I think you saw in the second half the performance was good. "We didn't have many shots in the first half and there were more in the second half, as soon as I had a chance I thought I'd have a shot. "Today's game was all about getting three points at home but the massive one comes next week at Burnley." Former QPR striker Bradley Allen: "If Spurs had got a second, it might have been a different story. But this result is a blow to their top four hopes." Andy in Corsham: Tottenham's run of lucky last-gasp results finally comes to an end. Kevin in Hornchurch: The last 15 minutes summed up why Spurs never manage to secure fourth spot. Far too sloppy and lazy. Chelsea forward then Palace backwards. Just not good enough for Champions league. Glenn in Norwich: Spurs have been robbed here by two awful refereeing decisions! The standards of officiating in the Premier League really is shocking. For Tottenham, they could have moved up to fourth place but defeat means they stay fifth, two points behind Southampton, who play Manchester United tomorrow. No more looking at the Premier League table behind your fingers Crystal Palace fans, as that win means things look a lot better now. Up to 15th and while only a point outside of the relegation zone, it puts a bit of the pressure on teams around them. Former QPR striker Bradley Allen: "In terms of passion this London derby was right up there. 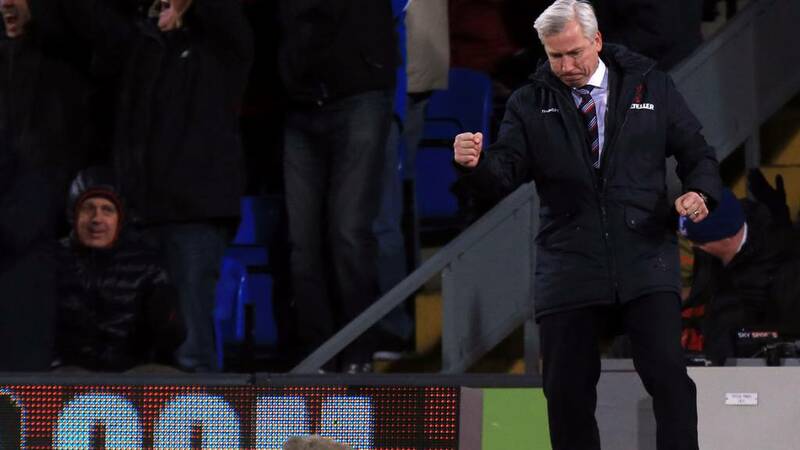 That's two wins on the bounce for Alan Pardew and Crystal Palace now. They were brave, resilient and showed real desire to get themselves over the line at the end. The players ran that extra yard, Pardew got his substitutions exactly right when they were tiring as well." Zavair Baakza: Crystal Palace is making a habit of playing their hearts out when mid-season they get a managerial change. What a turnaround! Abu Ali: Apart from keeping an eye on your team.in the league, the gap between Alan Pardew and Newcastle will be fun to see! Paul Cate: For all the stick Alan Pardew has got in his time, he's actually proving to be a very good manager. That's it! Crystal Palace end Tottenham's unbeaten run at seven games and climb out of the bottom three with a come-from-behind win. Two wins out of two for Alan Pardew. Wilfried Zaha, on the break, warms the gloves of Hugo Lloris. Surely that's it? Etienne Capoue sees a gap in the defence and has a go at goal from distance but Julian Speroni is down to make the save. Was that the last chance for Tottenham? Kyle Walker swings a cross into the area for Jan Vertonghen, whose header at the second attempt is too close to Julian Speroni. Time running out for Tottenham. Former QPR striker Bradley Allen: "Six minutes? Still all to play for here." Wilfried Zaha skips past tired Tottenham legs but shoots straight at Hugo Lloris. Crystal Palace want more goals! SIX minutes of time added on is shown by the fourth official's board, unsurprisingly resulting in boos from the home crowd. Final change for Crystal Palace as goalscorer Dwight Gayle goes off to applause from the Palace fans and on comes former Tottenham loanee Fraizer Campbell. Jeremiah Kariuki: Seems Alan Pardew has brought the winning mentality into Crystal Palace. Coming from behind and keeping the pressure to lead now! Luke: Those Newcastle fans are looking pretty pathetic at this moment. Championship beckons again for that's where they belong. Andy Brown: Great to see Wilfried Zaha playing with all the attributes that took him to Manchester United in the first place. Harry Kane is the next to test Julian Speroni with an effort from just outside the area. It is well hit, but Speroni is behind it. This is going to be a long five minutes for the hosts. Jan Vertonghen heads at goal but it is from too far out to trouble Julian Speroni, who clutches the ball to the sound of cheers from the home crowd. They are loving this. I bet Alan Pardew is loving this. Former QPR striker Bradley Allen: "Tremendous spirit from Crystal Palace. I said Wilfried Zaha was the man to get Tottenham's full-backs and he's done that. But what a finish from Jason Puncheon, and now Selhurst Park is bouncing. Can Palace hold on now? It's going to be a barnstorming finish to this game." How about this! Crystal Palace have turned things round as Jason Puncheon powers in a goal. Wilfried Zaha has caused Tottenham plenty of problems since coming on and he has a big hand in that goal, racing into the area before his pass deflects kindly for Puncheon who lashes the ball into the corner of the net. Can Jam: Should be a three-match match ban for Joe Ledley...Definitely amounts to cheating to win that penalty! Paul Moore: My goodness, what an absolutely disgraceful penalty decision from the ref. Javel Bleach: Fully expect Spurs to hit back and coast to the win anyway. Tottenham make another change as the swashbuckling Benjamin Stambouli, who has thrown himself into a fair few challenges in this game, is taken off before he can earn himself a sending off, Roberto Soldado replaces him. Tottenham are once again directing their attacks through Harry Kane as he flicks a header wide from Etienne Capoue's cross, but he had been flagged offside anyway. Crystal Palace also make a change, opting to introduce the pace and directness of Wilfried Zaha and sacrificing the aerial threat of Glenn Murray. Tottenham make a change immediately after that equaliser as Etienne Capoue comes on for Andros Townsend. What will their response be? Former QPR striker Bradley Allen: "I think the referee has to award that penalty because he hasn't made contact with the ball. Dwight Gale showed really composure from the penalty spot and has lifted the crowd. Palace are right back in this." Dwight Gayle picks up the ball and places it on the spot before confidently striding up to drive the ball into the net. No chance for Hugo Lloris. Game on. Twitter: "Very happy to be back in the field! We just missed taking the three points but there's plenty ahead of us. Come on City!" Aguero came on as a substitute in Manchester City's 1-1 draw with Everton at Goodison Park - his first appearance since he injured his knee against the Toffees at the Etihad Stadium in early December. Benjamin Stambouli charges forward and tries to feed a ball for Andros Townsend to run on to, but over hits it and the ball trickles out of play. After a good spell from Palace, Tottenham seem to have regained control now. Jack McLeod: Losing Yannick Bolasie and Mile Jedinak would have hurt Palace. Been their two most influential players this season. Hard task now. A lovely flick on by Harry Kane sends Nacer Chadli on his way, but he runs straight into trouble and Crystal Palace clear before breaking down the other end of the pitch and winning a corner, which comes to nothing. Pretty open game though, after Kane's opener. Benjamin Stambouli has walked a fine line with a few misjudged challenges in this game and the referee decides enough is enough when the Tottenham man goes in strong on Adlene Guedioura. Yellow card. Cameron Laws: Harry Kane is unreal. So glad he's been given his chance this year, Roy Hodgson I hope you're watching! Martin Golds: This run of form Harry Kane is in is superb. Get him called up for England, Roy. Will Jackson: Does anyone else actually play for Spurs other than Harry Kane?! Former QPR striker Bradley Allen: "This could the ideal game to introduce Wilfrid Zaha at some stage and get him running at Tottenham's full-backs." Almost an immediate response by Crystal Palace as Scott Dann knocks a ball into the box down for Dwight Gayle, who stabs a shot at goal but it is straight at Hugo Lloris. Palace know they need to come forward, will Alan Pardew drop his cautious approach and go more offensive? Former QPR striker Bradley Allen: "Harry Kane has been relatively quiet up to this point by his standards, but he is that kind of player with just one chance on the edge of the 18-yard box he can punish you. What a season he is having. He's on fire. Where would Spurs be without him?" Give Harry Kane a chance and he will score. Crystal Palace had marshalled him superbly in the first half but let their guard down for a brief moment as the striker finds space on the edge of the area and swipes the ball into the far corner. That's six in his last six for Kane. Adlene Guedioura looks to make an immediate impression as the midfielder curls a fine cross into the box that Jan Vertonghen does well to hook away. Palace then win a corner, which is scrambled clear. Jack in London: As a Spurs fan I am pretty disappointed that after beating Chelsea 5-3 that we are now drawing 0-0 with Palace. Could Tottenham be in the top four in 45 minutes' time? Or Crystal Palace out of the relegation zone? The second-half is under way, with the hosts having made a change - Barry Bannan off and Adlene Guedioura on to make just his fifth Premier League appearance this season. Tottenham had more possession in the first half but managed just one shot on goal. Palace, though, have made the most of the ball when they have it, getting forward quickly and arguably had the best chance when Glenn Murray's shot was saved. Will Alan Pardew look to attack more in the second half? Or hope another big chance like Murray's comes Palace's way again? Former QPR striker Bradley Allen: "Alan Pardew can feel happy with the efforts of his players in the first half. Tottenham you feel need to show a little more if they want to go on and win this game." A few moans from the home fans greet the half-time whistle, but seemingly directed at the officials rather than their new manager. Solid display by Crystal Palace, who defended well and had a few chances of their own. Harry Kane finally gets free of his markers and races into the Crystal Palace half but is brought down by Scott Dann and the Palace defender is booked as a result. Abu Ali: Hugo Lloris is so great, the one Spurs player I would like at Arsenal, so much better than what we have. Luke: Lloris showing there how important a top keeper like himself and David De Gea can drag poor teams and managers through the season. Matt Cartwright: Great save from Lloris, Spurs should be winning this but nothing coming from all our possession. Did Federico Fazio push Dwight Gayle? The Palace forward chases a ball over the defence and into the area and looks to be nudged by Fazio, Palace fans cry for a foul, referee says no. Tough to call. Stavros Makrozachopo: I think Alan Pardew with his approach so far is showing much more respect than he should against Tottenham. Very cautious. Harry Kane has three players around him whenever Tottenham get forward and it is a tactic that is working well for Crystal Palace. After a couple of early half chances he has not been in this game. Still think Palace could do with being be a bit more adventurous though. Katy in London: As a Southampton fan watching with my Geordie boyfriend, we have fairly different views on who we want to win this game. It's ex manager versus ex manager! Former QPR striker Bradley Allen: "For the first time Palace got through a couple of challenges and that's the biggest chance of the half. The presence and the spread of Tottenham goalkeeper Hugo Lloris did enough to deny Glenn Murray." Fantastic stuff from Hugo Lloris! James McArthur pokes the ball through a static Tottenham defence and Glenn Murray shows a burst of pace that belies his size to get onto it, he looks certain to score but Lloris is out quickly to close down and deflect Murray's shot behind. West Ham goal-scorer Andy Carroll on his celebration: "I had been out wide and the fans were giving me some and when I scored I had to get out there and give them some back to tell them to shut up! I enjoy the banter. When I was a fan and a season-ticket holder at St James' Park I would shout at players on the pitch so I know what it is like. "We have to keep going and get back winning games and pushing for Europe and I don't see why we can't do that." A succession of corners come to nothing as Tottenham resume the attacking initiative after a brief foray into the Spurs half by Palace. Former Newcastle United striker Andrew Cole: "Newcastle in the first half were brilliant and caused Chelsea problems, but in the second half Chelsea, as you expect, came out and improved." Asked once again if he wants the Newcastle job full-time, John Carver tells BBC Sport: "A million percent I want this. "I've not had any conversations with Mike Ashley. I've spoke to (managing director) Lee Charnley a number of times to tell me to prepare the team but that's it." On the defeat at Chelsea: "When we got here people said we would park the bus, we didn't do that, we created some great chances but switching off just before half-time is a cardinal sin. "It's not as if we didn't talk about it because we conceded from a short corner against Leicester last week and we watched a video so we'd talked about it but that's what happens when you play top sides. "It's been a difficult time because of the Christmas period so we have not had much prep time and this is the first week we've had a full training week and they executed the plan as I wanted. I told them afterwards I'm proud of them." Jeremiah Kariuki: Crystal Palace holding on well against Spurs. They look the more likely to score this far in the game. Much better now from Crystal Palace, who are coming forward and showing the "beautiful flight" Alan Pardew is after. Barry Bannan launches the ball into the area and finds the head of Glenn Murray, but his effort goes wide. Andros Townsend goes in the book for his attempt to win back possession after being tackled by Martin Kelly. From the subsequent free-kick, Damien Delaney hooks a shot over the bar for Palace. QPR manager Harry Redknapp: "They started better, then we got a grip of the game. I thought they were rocking, we were passing the ball better, then we gave a horrendous goal away. You can't give goals away like we did, they were poor. After that it's difficult and they were dangerous on the break. "There was no lack of effort, I can't fault the players on that. It's not easy. We are what we are. We finished below them last year and our team hasn't changed an awful lot. It's tight, there won't be much between us. There, six or seven teams still in it. "A win is vital at any time, but they aren't easy to come by. It's a big step up from the Championship. "We need to win some games away from home, but we're finding it difficult to do. If we're not good enough to win, that's where we are. We had opportunities, but you can't give two bad goals away like we did." Former QPR striker Bradley Allen: "It was great play from Spurs. It was behind Christian Eriksen but you would expect a player of his ability to score from there. Tottenham need to keep probing the Palace defence and hope they create another chance like that in this half." So close for Tottenham! Kyle Walker gets away down the right and crosses into the area but the ball takes a crucial deflection off a Palace defender, taking it just behind Christian Eriksen who twists his body to meet the ball but can only direct it just wide of the post from eight yards. It is all defence and no attack for Crystal Palace at the moment, something highlighted by the fact that Glenn Murray - the Eagles' most advanced player - has yet to get anywhere near the Tottenham box. This is not a classic, not by any means, but Alan Pardew will be happy with how things are going so far against an in-form Spurs. Hull City manager Steve Bruce: "Sometimes it's a frustrating game. There was nothing in it, but the turning point was when we lost two strikers (Nikica Jelavic and Abel Hernandez) and after that we huffed and puffed but lacked that stuff you need at the top of the pitch. "From the first day of the season for a club like us to have eight or nine players missing is far too many - we cannot cope. We need to get some people fit and get a couple in if we can. "Jelavic has hurt his knee, Hernandez his groin. We will try to bring in a couple of players in January. It is essential that we do that." Chants of "Alan Pardew's red and blue army" from the home crowd but it is Tottenham who again come forward, this time Harry Kane shooting from the edge of the area. It is a half-hearted effort though, and straight into the hands of Julian Speroni. Former Newcastle United striker Andrew Cole on Saido Berahino: "He's got a great opportunity at West Brom. I'd be surprised if they sold him in January because they need goals, but in the summer for sure." West Brom head coach Tony Pulis: "It was a hard-fought game, we had the best chances, but it was very important to get off to a good start. Our record at The Hawthorns has not been brilliant so we need to win our home games and pick up points. "There's nothing better than winning games to improve the confidence. We had a couple of great chances in the first half and kept a clean sheet to move forward. "The expectations here are more intense than at Crystal Palace, but it's the shortest period left in the season that I've ever stepped into, so in that sense it is tougher than last season. Last year I had six weeks to look at the squad before the transfer window opened and see where I had to improve." On striker Saido Berahino, Pulis added: "He has wonderful talent, his balance is first-class, he can shift the ball from right to left foot and he is a goal-scorer. We need to improve that position, not lose a striker." Everton manager Roberto Martinez: "You always feel that the first goal as the home team was essential, even though the reaction we had after going behind was probably the most pleasing aspect from the whole performance. "On the ball we are slowly getting back to the level we know we have but when you are in the middle of bad results that character and personality was vital to get that positive result. "To get a draw against a team with confidence and that run of results is a positive in the manner that we achieved it. "The way to talk is on the pitch and we have seen in the last two games a really strong group of players." Mathew Penistone: One week its get out! Next week you are hailed a hero by some new friends singing songs about you. Alan Pardew must be loving life. Former QPR striker Bradley Allen: "With his momentum Nacer Chadli went to ground and with the ball having escaped him he perhaps tried to bend the rules somewhat. Otherwise Tottenham are moving the ball well and controlling the game well so far." Nacer Chadli breaks into the box, goes down under a challenge but no penalty. Whistles from the home crowd, who suspect a dive, a thought seemingly shared by Alan Pardew who shouts furiously in the direction of the referee. He wants a yellow. Leicester manager Nigel Pearson: "I am very pleased. We deserved to win in a game that was not one of our better performances with the ball. We dominated the game in terms of chances. "We are still in a tough position but we are making progress. I am glad the players are passionate about what goes on. I am not making any comment regarding the situation around the sending off (Matty James). I have seen it and would like to see what is in the report from the officials and see how things are reported." Crystal Palace have the height and physical presence Glenn Murray spearheading their attack, with the pace of Jason Puncheon and Dwight Gayle in support but they are getting no chance to test the Tottenham defence. All Spurs, but no real chances as yet. "Over seven hours without a Premier League goal for Aston Villa. I asked Paul Lambert if he was chasing a new striker? Says he'd rather a creative player." Tom: Stuart Pearce is a Nottingham Forest legend and it's breaking my heart to see us failing under him. Hope he turns us round. Russ in Hereford: How long has Stuart Pearce got left? So so sad it has not worked out for him. Sad day yet again being a Forest fan. Swansea manager Garry Monk: "We knew we had to match West Ham physically - it looked like two good teams going at it, I was a little disappointed that we allowed Andy Carroll the space to pick his spot. "The situation with Wilfried Bony is still ongoing. The negotiations with Manchester City are still happening in the last few days. I was prepared for Wilfried to go for the next few weeks anyway and I will be ready to deal with whatever comes out of that." Tottenham are seeing plenty of the ball and getting forward quickly at every opportunity as Andros Townsend tries to pick out Harry Kane but, at the moment, the Crystal Palace defence is showing good discipline, with two banks of four quickly back to close the gaps and limit Kane's options, resulting in him hitting a pass straight into a crowd of Palace players. West Ham assistant manager Neil McDonald: "We created chances and got at them and we are very disappointed not to come out with three points. James Collins got a knock on the head and was off the pitch when Swansea scored. Our physios came on and the referee said that he had had a knock on the head and needed to come off, which I think was a misunderstanding and that was disappointing. We work really, really hard to defend set-pieces. "I was on the phone to the manager who had a few little pointers for the game as he was watching on the television. We tried to relate that to the players." Danny Rose curls a shot, or maybe it was a cross, well wide but it is a good, confident start by Tottenham, who have won four of their last five games in the Premier League. They will fancy themselves to spoil the Pardew party. Micah in Chepstow: QPR boss Harry Redknapp is a joke, not only have we not picked up any points away but he's frozen out our most talented player in Adel Taarabt but he came in today despite being unfit and was our best player. We're too reliant on Charlie Austin and we don't know our best back four. Barton is shocking, absolutely overrated. Redknapp has to go, enough is enough. QPR goalkeeper Rob Green: "It's a feeling of disappointment and frustration. It's a big game for us and them, but not enough of the team have put in a good performance. We gave away two poor goals and it's cost us. "Nothing needed to be said in the dressing room. We have come to a tough place. It was a day for getting the basics right and we didn't do that. We've really not helped ourselves. We had to score three to win on the back of the goals we conceded. "The away record is not something you can put your finger on. We don't go into the games any different. We've conceded poor goals away from home continually. Today was no exception." Former QPR striker Bradley Allen: "Alan Pardew's job description between now and the end of the season is simple. Keep Crystal Palace in the Premier League." There is an air of optimism at Selhurst Park, no doubt about it, but will it still be there in 90 minutes? Tottenham get things under way. "There are some real positives for Roberto Martinez and Everton today for sure. They showed some great resilience. John Stones was superb at the back and Romelu Lukaku looks like a player about to come into form in front of goal." Manchester City manager Manuel Pellegrini: "In the first half we had clear chances. In the second half Everton improved and had a chance to draw and did so. If you said at the beginning you are going to draw at Everton away maybe it is not so bad. "It's so important in first 25 minutes because if you score then it is a different game. We didn't and Everton grew in the second half and it was a very close game in the last 35 minutes. We had a lot of chances but were maybe missing the last pass. "We knew before the game the most dangerous part of Everton was at set pieces. They had a free-kick and scored. We could do more for the goal but we didn't. "It's important Sergio Aguero is back. He is a very important player for the team." Flags are waving and a huge banner stretches out alongside one end of the ground with the words "our season starts now" on it. Alan Pardew strolls out and applauds the crowd. He certainly has their support now, but will only maintain that by picking up the points, starting this evening. Alice Stainer: Fantastic you Clarets! Most encouraging thing is that there's a range of goalscorers in the last few games. Adam Maurice Sheehan: Pathetic from QPR and especially Harry, we bring in Mauro Zarate and he starts an unfit Adel Taarabt. Fiona Endersby: When was the last time QPR won a point away from home? Former Newcastle United striker Andrew Cole: "If you look at Burnley as a whole, a lot of those guys are English guys, playing for the first time in the Premier League and playing as if it could be their last season in the Premier League. It's taken time, but they're having a good go at it and they're getting results. "For QPR, it was one of their better performances away from home. They looked a lot better today, but they still come away with no points." Burnley manager Sean Dyche: "Credit to both teams, the weather was atrocious. The ball was going all over the place. I thought we did slightly better, created good chances. Their keeper has made some fantastic saves. "We've been in good shape all season. I'm not trying to fool anyone. This group is open-minded, trying to challenge themselves in this division. I'm really pleased with how the players are going about it. "Most people had us down as needing snookers by Christmas. We don't. We've been performing well, not always getting what we thought we deserved. You look at the goals we're scoring - Scott Arfield's today, if Alexis Sanchez scores that, it would be shown 100 times over the weekend." Crystal Palace boss Alan Pardew, speaking to Sky Sports: "We have to come out of our shell. We have to open our wings and see if we have some beautiful flight in there, which I am sure we have. We have players who can express themselves and they need to do that." The Crystal Palace eagle has done just what Pardew is after from his players which can mean only one thing - kick-off is just a few minutes away. Aston Villa boss Paul Lambert: "We have to put it right, we have to do better in the last third. We have to keep working hard and hopefully it will come. "We need creative lads to help the group. We have to do a lot better in the final third." The Football League's bottom side Hartlepool beat Cheltenham 2-0 to close the gap on 22nd-placed Carlisle to seven points. League Two leaders Wycombe beat York 1-0, with second-placed Burton seeing off neighbours Mansfield 2-1. Lowly Northampton surprised promotion-chasing Exeter 2-0 in Devon, while mid-table Cambridge beat Carlisle 1-0. Newport beat Portsmouth 1-0 in a disputed win with the assistant referee flagging County's goal for offside but the referee overruling him. AFC Wimbledon lost to Stevenage by the same scoreline they did against Liverpool on Monday 2-1. Dagenham & Redbridge drew 0-0 with Oxford, as did Morecambe and second-from-bottom Tranmere and Southend and Plymouth. Tottenham have arguably one of the best English strikers in the Premier League in the shape of Harry Kane. He has five goals in his last five Premier League games and will be looking for goal number six tonight. It has been a pretty good season so far for English strikers, but who is the best in the Premier League right now, and why? Chelsea assistant coach Steve Holland, talking about Thibaut Courtois' injury and the omission of Gary Cahill: "It was something that Thibaut picked up in the game against Tottenham. If it had been vital to play he could but when we had Petr Cech as a replacement it was a no-brainer. "Dropped is not a word we would use (about Cahill). It's a long, long season and we have a big squad of players. We get criticism for not giving young guys a go but I don't think Kurt Zouma put a foot wrong. A 20-year-old making his first league start and if he carries on playing like that it won't be his last either." Chelsea assistant coach Steve Holland: "The two halves were different. You have to give credit to Newcastle, I think Steve Carver and Steve Stone gave them a good set-up today. We didn't play so well but got the breakthrough. "The team was much better in the second half and controlled the game, playing some good football around their box. "You always want to play well but that's now always possible. Today was a 45 minutes which we haven't had often over the course of the season but we still managed to be 1-0 up. It is important that when you don't play as well as you'd like to still get the result." Little known fact (maybe) - this is a game between two of Alan Pardew's former clubs. While he spent four years at Crystal Palace during his playing days, he also had a lesser known loan spell at Tottenham, making cameo appearances for the club in the now defunct Intertoto Cup in 1995. In a way, he is part of Tottenham's history. Unwanted history, granted, but history all the same. Spurs suffered their all-time record defeat in the European competition - an 8-0 defeat to FC Koln - a game in which the then 34-year-old Pardew featured. "We literally had the youth team, a couple of reserves, and some mercenaries - I was one of them. I still enjoyed it. It was a great experience,"
Jared Maobe: What a player will this boy Kurt Zouma will end up to be! Commanding full debut. Gully: Nobody talking about Zouma which shows just how brilliant he was today. D J Leyland: Petr Cech showing us why he's still number one to the fans! Highly rated Thibaut Courtois has let far to many goals in this season. Tonight, Manchester City are pegged back by Everton, while Chelsea take advantage with a win over Newcastle. Everton fans... do you still want Martinez out? A big day at the bottom, we want to hear from Burnley, Leicester and West Brom fans who must be delighted… and QPR fans who can't get a win on the road. Alan Pardew takes charge of Crystal Palace for the first time in the Premier League this evening. He oversaw a straightforward FA Cup win in his first game as Palace boss last weekend, as they won 4-0 at Dover. It was a good display by the Eagles, but this game will give a better indicator of the task ahead for Pardew. Bristol City overtook Swindon at the top of League One thanks to a 4-0 victory over Notts County, with in-form Matt Smith scoring his ninth goal in five games. Crawley stand-in keeper Matt Harrold conceded a 96th-minute equaliser to MK Dons' Dele Alli in a 2-2 draw. Preston remain third despite losing 2-1 to play-off rivals Sheffield United. Relegation-threatened Colchester stunned promotion-chasing Peterborough 2-0, while Scunthorpe beat Walsall 4-1. Oldham's difficult week ended on another bad note as James Coppinger rescued a 2-2 draw for Doncaster in the 95th minute. Calvin Andrews scored an injury-time winner as Rochdale saw off 10-man Bradford 2-1. Crewe beat relegation rivals Gillingham 3-1, Chesterfield beat Port Vale 3-0, Barnsley beat Yeovil 2-0 and Fleetwood beat Leyton Orient 1-0. Myles: Forgotten what a goal fest feels like. Disgraceful from Aston Villa. Paul Lambert should either buy players or the club should pay him to go out the door. Mike ‏Seal: With these clueless performances Paul Lambert has to go. Poor tactics and now no desire. Worst team in years. Dan Brewer: We're in big trouble but Lambert will undoubtedly say he thought we were excellent. Burnley goal-scorer Danny Ings: "It's massive. It's our own mini-league down there, so it's important we pick up points in games like this. "Our home form has always been good, so it's important that, against the teams around us, we turn up and give it our best. That's what we did today." Bournemouth now lead the Championship table only on goal difference after 10-man Norwich beat them 2-1 with new Canaries manager Alex Neil watching the game. Clayton Donaldson scored a hat-trick as Birmingham continued their climb up the table with a 3-1 victory over Wigan. Ian Holloway's Millwall lost 1-0 to his former club and relegation rivals Blackpool, who are bottom of the table. Leeds moved closer to the relegation zone as they were held 1-1 by Bolton, with Eidur Gudjohnsen scoring his first Wanderers goal in 14 years. Cardiff wore blue in their 1-0 victory over Fulham after changing their colours back from red. Huddersfield beat Watford 3-1 with Joel Lynch scoring an overhead-kick, Brighton beat Charlton 1-0, Brentford did the same against Rotherham, Sheffield Wednesday beat Nottingham Forest 2-0 and Reading and Middlesbrough played out a goalless draw. West Ham goal-scorer Andy Carroll: "We came out and tried to keep a clean sheet for a win but it wasn't to be. The referee let a lot go that others wouldn't. It was a real battle out there. Obviously coming off with the lead at half-time we wanted three points but the Liberty is a difficult place to come and we will take the point and move on." Crystal Palace boss Alan Pardew is without Yannick Bolasie, who is on international duty in the Africa Cup of Nations, which means the new manager has to make changes to the team which drew with Aston Villa. Barry Bannan, Dwight Gayle and Glenn Murray all start, while Wilfired Zaha and Adrian Mariappa are on the substitutes' bench. Tottenham make two changes to the team which beat Chelsea in their last Premier League outing, with Mousa Dembele and Benji Stambouli replacing Ryan Mason and Nabil Bentaleb. Crystal Palace XI: Speroni, Kelly, Delaney, Dann, Ward, Puncheon, McArthur, Bannan, Ledley, Gayle, Murray. Tottenham Hotspur XI: Lloris, Walker, Fazio, Vertonghen, Rose, Stambouli, Dembele, Townsend, Eriksen, Chadli, Kane. "A vital win for West Brom. It wasn't pretty but Tony Pulis and the Baggies fans won't care about that." So, QPR drop into the bottom three. Burnley are up to 16th. Clarets fans rejoice, singing: "Charlie, what's the score?" in the direction of a certain Rangers striker. Steven Caulker's header is tipped over. QPR so close to nicking a point. "It was a brilliant game. Manchester City dominated the possession, but if you are talking about pure chances then Everton maybe had the most clear cut. Manuel Pellegrini will see it as two points dropped though." We're into the second minute of the four which were added on. ...Ciaran Clark is then sent off for Aston Villa in the aftermath as players clash. Manchester City send on Aleksandar Kolarov for Samir Nasri. "A brilliant finish, Everton going for the win as well. It's end to end." Three minutes of time added on. Manchester City on the front foot and Phil Jagielka makes a superb tackle in the box. West Brom are holding the ball in the corner, they are desperate for the win and who can blame them? They will climb up to 14th, two points above the relegation zone, if they hold on. Manchester City pouring forward and Samir Nasri drives in a low shot which Joel Robles is fully behind. Are Aston Villa threatening an equaliser? Not really, although they have half a chance as Alan Hutton's shot results in a scramble in the Leicester box, the ball spills out to Aly Cissokho, who blazes over. Lukasz Fabianski makes a desperate, fingertip save to deny Andy Carroll from point-blank range after spilling Carl Jenkinson's free-kick. A big, big save. Into the closing stages of the 15:00 GMT kick-offs, will there be any late drama? Championship leaders Bournemouth are now losing 2-1 to Norwich with Cameron Jerome pinging one home from outside the box. The Canaries, with new boss Alex Neil watching, are down to 10 men. Burnley pressing now and Kieran Trippier's header is tipped over by Rob Green. "Manuel Pellegrini has thrown Frank Lampard on because he wants to go for a win. They need more than a draw here with Chelsea winning." Stewart Downing tries to bend one in from the edge of the box, but his effort is tipped wide. From the corner, the ball lands at the feet of Carl Jenkinson who smashes one from 30 yards but again the keeper makes a good save. Hammers on top. As things stand, Chelsea are taking sole occupancy of first place in the Premier League. They are strolling to a win at Stamford Bridge, Newcastle's endeavour seemingly spent after a very good first half display. Former Manchester United striker Andrew Cole: "If Tony Pulis and West Brom are going to stay up, they will need Saido Berahino because he scores goals." Bottom club Hartlepool lead Cheltenham 2-0 with Rakish Bingham scoring his first goal for the club. Newport lead Portsmouth 1-0 with Mark Byrne scoring despite the assistant referee flagging Aaron O'Connor offside in the move. Fred Onyedinma has put leaders Wycombe ahead against York. Liam Hughes puts Cambridge 1-0 up away to struggling Carlisle. Bermuda international Reggie Lambe has scored his first goal in English football to pull one back for Mansfield against Burton. That's 2-1 now. Stevenage are2-1 up against AFC Wimbledon with Simon Walton scoring a penalty. "Forget Charlie Austin, the Burnley fans have a new pantomime villain after referee Andre Marriner disallowed that Ashley Barnes' goal for a foul on Rob Green. What was already an open game has become even more stretched as QPR push for an equaliser, with the Clarets looking increasingly dangerous on the break." "A brilliant response from Everton. A great ball from Leighton Baines who used the wind to bend it in and Steven Naismith got to the ball ahead of City goalkeeper Joe Hart to head home." Finally, a goal! It has not been the best spectacle but West Brom take the lead when they are given an indirect free-kick inside the Hull box after Ahmed Elmohamady's pass back to keeper Allan McGregor. Victor Anichebe rolls the ball to Saido Berahino, who drives it through the wall and into the net. Burnley feel aggrieved, they think they should be 3-1 up. Ashley Barnes is up challenging with Rob Green, who goes down to allow Barnes to hook the loose ball into the net. The ref blows and gives... a foul, but not before Turf Moor celebrates. All afternoon, England goalkeeper Joe Hart has struggled to deal with Leighton Baines's deliveries and he pays the ultimate price this time as he is caught in two minds about coming for it and Steven Naismith capitalises to glance the ball home. Time running out at The Hawthorns and West Brom make a couple of changes, Victor Anichebe on for the ineffective Brown Ideye, before Craig Gardner replaces Stephane Sessegnon. Less than 15 minutes left for someone to grab what would surely be the winner. "Roberto Martinez is not happy. He felt there was a shout for offside, or a handball from Pablo Zabaleta, in the build-up to the goal but David Silva was so composed with his shot which deflected somewhat fortunately for Fernandinho to head in. It's come at a period in the game when Everton were actually playing the better football of the two sides." There it is - Manchester City finally take the lead, although there is an element of fortune about their strike. Pablo Zabaleta appears to handle the ball in the build-up and, against the run of play, the visitors pour forward. Samir Nasri and David Sila work an opening, with the Spaniard taking a shot which Fernandinho helps over the line with his head. A great chance for Aston Villa as a deep corner evades a crowd of players in the middle of the area and falls to the unmarked Tom Cleverley, whose sidefooted effort ends up closer to the corner flag than the goal. Swansea's recent pressure pays off as they level through Bafetimbi Gomis, who glances home a header from 12 yards out despite the best efforts of Mark Noble on the line. Gomis responds by displaying a French flag in honour of those who died in Paris this week. "Before Phil Jagielka put the ball in the net, there was more than a nudge on Joe Hart by Steven Naismith which has forced the ball out of the Manchester City goalkeeper's hands." Hearts in mouths time for Manchester City fans as Joe Hart drops Leighton Baines's free-kick - after being smashed in the back by Steven Naismith - and Phil Jagielka puts the ball into the net. But the flag is up. The real Chelsea has arrived. Two goals to the good, the Blues are playing some beautiful football now as some nice build-up play ends with Diego Costa volleying straight at Tim Krul. Crawley, who have striker Matt Harrold in goal, now lead MK Dons 2-0 with Izale McLeod scoring both goals against his old side. George Elokobi has put Oldham 2-0 up against Doncaster as the Latics look to end a tough week after the Ched Evans debacle on a happier note. Gillingham have pulled one back at relegation rivals Crewe with Bradley Dack making it 2-1. Sheffield United lead Preston 1-0 with Marc McNulty scoring. Freddie Sears makes it 1-0 to Colchester at Peterborough. Michael Cain pulled one back for Walsall, but Scunthorpe striker Paddy Maddenhas made it 3-1. George Waring has scored on his Barnsley debut as they lead Yeovil 1-0. And Chesterfield goal machine Eoin Doyle, who has been linked to Celtic and about half the teams in the Football League, has doubled his side's lead against Port Vale. Chances at either end at Turf Moor. After Eduardo Vargas heads straight at Tom Heaton, Danny Ings goes close to extending Burnley's lead. Taking down Kieran Trippier's ball over the top, Ings just shoots wide. Norwich are down to 10 men against Championship leaders Bournemouth after Jonny Howson was sent off for a crunching tackle on Yann Kermorgant. Rohan Ince has put Brighton 1-0 up at Charlton and Brentford lead Rotherham 1-0 with Scott Dallas scoring a volley. "Hull hanging on for a valuable point. West Brom's players and fans are being urged to raise it up a few notches by Tony Pulis." A double change for Swansea as Nathan Dyer and Wayne Routledge make way for Marvin Emnes and Modou Barrow. It seems to have injected some life into the hosts as well. Bafetimbi Gomis immediately combines well with Emnes but cuffs a shot over the bar after a neat one-two. With 25 minutes to go, Manchester City bring on Sergio Aguero in place of Stevan Jovetic. I've just seen a plastic bag flitter across the pitch at The Hawthorns. That was interesting. Sadly nothing else on the pitch is at the moment. "It's getting to the point now where Manchester City must surely start to think about bringing on Sergio Aguero or Frank Lampard." Excellent defending from John Stones, who reads a Manchester City counter-attack and gets across to put the ball out with Stevan Jovetic waiting to pounce. Leonardo Ulloa faffs about with the ball too long in the Aston Villa area and is tackled, but the hosts want a penalty, boss Nigel Pearson remonstrating angrily on the touchline. Nothing given though. The Hull defence, unsurprisingly, is posing a very different beast to Gateshead's for Saido Berahino - the striker knocking in four against the non-league side in the FA Cup last weekend. He had that one good chance in the first half and is on the end of everything West Brom do in this half, but has yet to find his shooting boots as he curls over. "I think Oscar has played a nice supporting role for Cesc Fabregas and Nemanja Matic and, sometimes, that's all you need because your time will come. I think Oscar has played that role very well." The Clarets are the better side in this second half and Ben Mee heads wide from a corner. One more should put this game out of reach. "Everton's approach should be a very simple one - get Romelu Lukaku up against Eliaquim Mangala, who is clearly unable to handle the giant striker when he runs at him. Goodison Park crowd on to this and urging Lukaku on." Brad Guzan is keeping Aston Villa in this game as he parries Marc Albrighton's volley away. The visitors are struggling. "You have to watch this goal on Match Of The Day tonight. That should be game over for Chelsea now." They say the sign of a title-winning side is when they win playing badly, and that looks to be what Chelsea are on course to do as they grab a second. Give Diego Costa a chance and he will score, the striker picked out by Oscar's inventive flick inside the area and Costa makes no mistake. "Romelu Lukaku has looked like he has the beating of Eliaquim Mangala all afternoon and brought a fine save out of Joe Hart." Romelu Lukaku is making Eliaquim Mangala look average today and he turns the big City defender inside out before firing in a low shot which Joe Hart gets his fingertips too. Moments later, a cross comes into the box and Phil Jagielka goes down as Mangala climbs above him. Looked a good penalty shout, but it's not given. The Hammers almost double their lead but James Collins heads a corner wide. Eden Hazard's ball behind the defence is just out of the reach of Diego Costa, who had a very quiet first half. Chelsea have the lead but Newcastle have been more than in this, and the hosts will want a second to settle a few nerves around Stamford Bridge. "It's been cagey opening to the second half and a dogged performance from Everton. The longer the game goes on at 0-0 the more you sense the home side can nick the win." Eidur Gudjohnsen has levelled it up for Bolton against Leeds with a penalty three minutes into the second half. That's his first Trotters goal since a 2-2 second-tier play-off draw against Ipswich in 2000. Dean Holdsworth and Marcus Stewart were the other scorers that day. Sheffield Wednesday are 2-0 up away to Nottingham Forest with Chris Maguire netting. Ashley Barnes, who has a spectacular goal in his locker, almost puts Burnley 3-1 ahead when he watches the ball over his shoulder and volleys goalwards from 12 yards out but Rob Green is equal to the effort. Top work Brad Guzan! The Aston Villa goalkeeper goes for the Hollywood save to keep out Matty James's header, the Leicester man sticking out his neck to reach Marc Albrighton's cross inside the Villa area. On Wilfried Bony potentially signing for Manchester City: "Wilfried Bony is made for the Premier League. He's strong, he's athletic, his link-up play is first class. With the likes of David Silva, Yaya Toure and Sergio Aguero - it could be a fantastic relationship with that team."